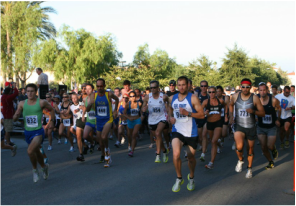 Ran a tune-up 5K on Labor Day in the City of Rancho Santa Margarita. Indications were that this might be a tough course to PR on. The first mile was a long gradual uphill, gaining at least 150 feet. The second mile gave it all back and the third was a little of both with some 50ft up and 50ft down sections. Temps were around 65-67 at the 7:30 start and the sun was out. But considering the much higher temps we had the week prior, I had no complaints about the weather. I pre-ran the course as a warm up with a runner I have been coaching for one month and helped her with some pacing strategy and tips. Sabrina had been pretty nervous about this race because her 5K PR 3 months prior was 21:14 and I had predicted she was in shape for a 19:16. Her #2 goal was sub 20. For my goal I wanted to give 16:30 a shot but since I only recently started adding some speed work to my marathon training wasn’t all that confident that I average those paces. After some last minute strides, back loaded into the start area and after the worlds’ shortest pre-race speech .. “Let’s get this thing going” … and a blast of the air horn we were off. The diabolical course planner decided to put a 90 degree turn about 100 yard from the start line so I went out real quick and was #3 around the turn. After the first .2 or so I was #2 and chugging up the long straight grade. At about mile .7 was passed by 2 runners. I could tell I was running right on the edge by my perceived effort and was really glad to finally turn the corner and start heading downhill for mile 2. I worked on lengthening my stride, picking up some speed and getting my HR to settle down. Usually mile 2 in a 5K is a bear but here it was a dream and I was clicking it off at around 5:10 pace. I did get passed again, this time by a high school kid but he only got ahead about 10 to 20 feet. Mile 3 was tougher. Started to feel the slow down on the little hills and the breathing was getting labored but just pressed on. 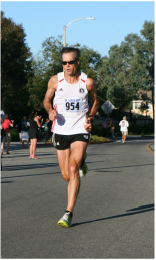 I noticed the high school runner slowing down so I focused on keeping my turnover high and I caught and passed him. But on the last corner and just 300 meters to the finish he passed me back. Despite my best attempt at a finishing kick I couldn’t pull him in and crossed the line in 16:42 for 5th place overall and 1st AG. After a quick chat with my crew chief I went back to the course to watch and see the other runners coming in. Just before the 19 minute mark I could see Sabrina coming down the final stretch looking strong. Just in front of her was a fast friend in the same running club who she didn’t think she could stay with. I yelled, I screamed for her to dig deep and watched as she crossed the line in … 19:16. sweet! A big congratulations to Sabrina for a big PR and staying mentally and physically tough at the very demanding 5K distance. Wrapped everything up by hanging out with the running club and loading up with the pancake breakfast. Here’s a couple pictures to fill out the report.